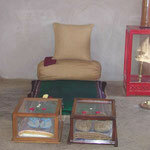 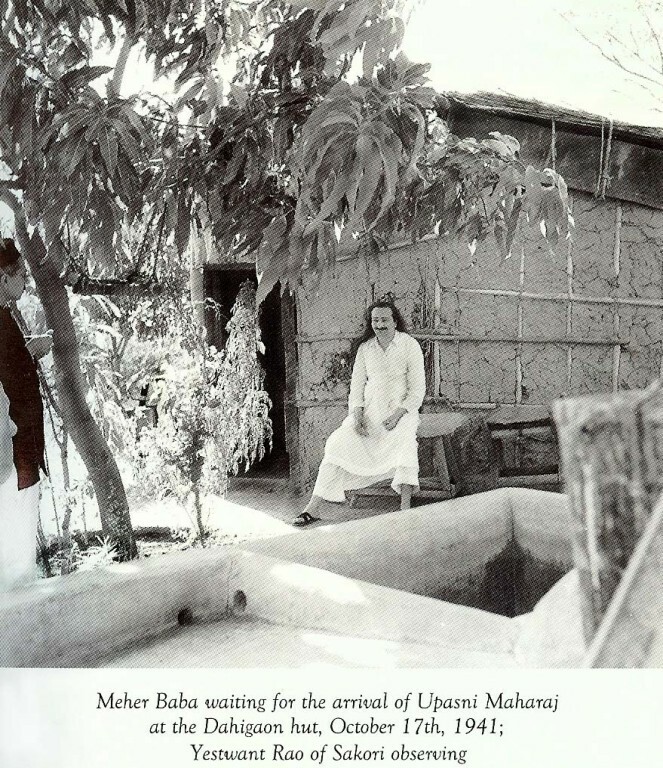 Upasni Maharaj - meherbabatravels jimdo page! 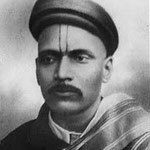 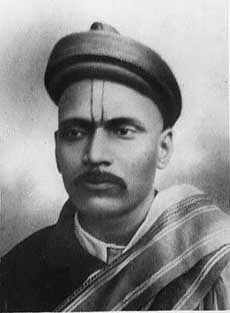 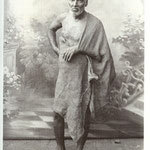 Upasni Maharaj, born Kashinath Govindrao Upasni, (May 5, 1870 – December 24, 1941 ) was considered by his disciples to be a satguru. 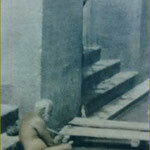 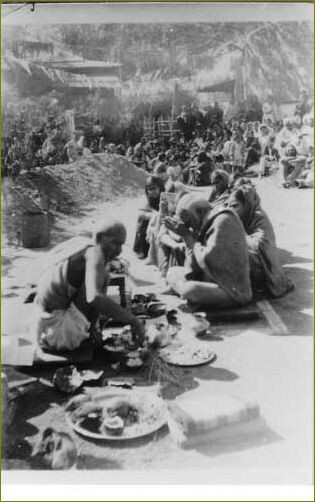 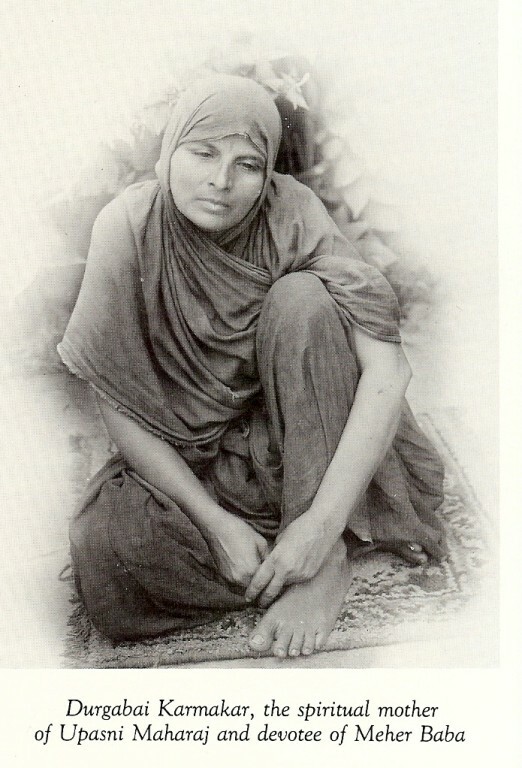 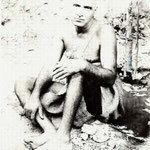 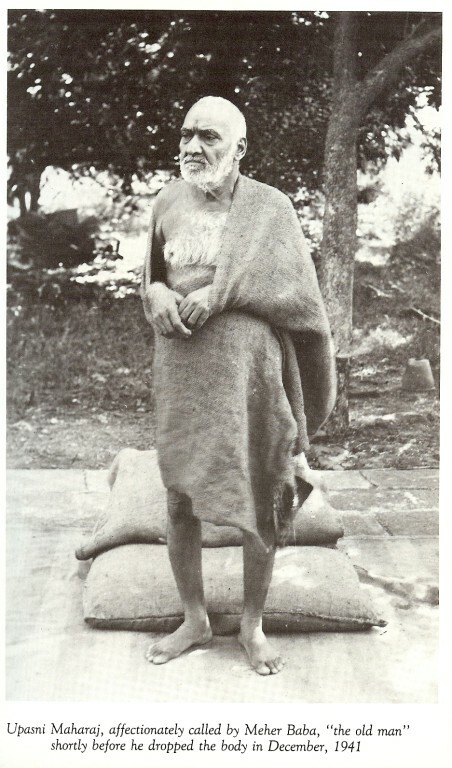 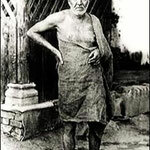 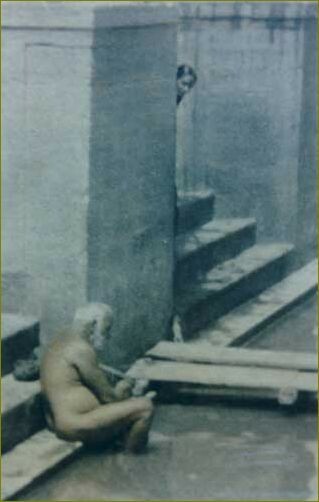 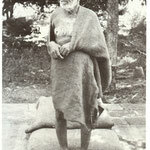 He lived in Sakori, India and is said to have received God-realization from Sai Baba of Shirdi. 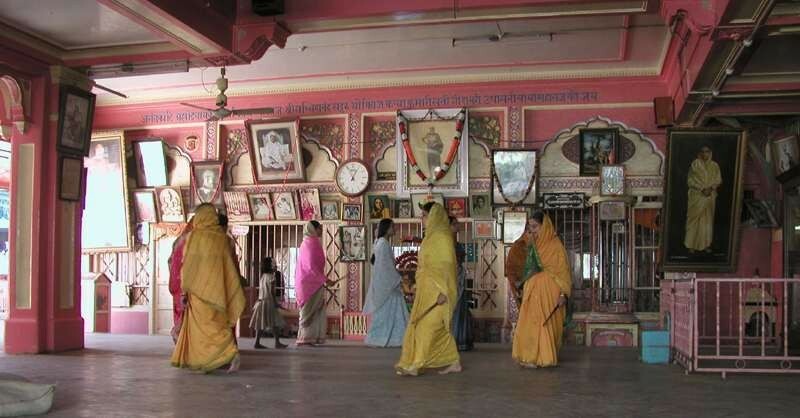 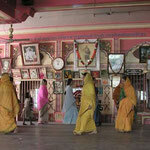 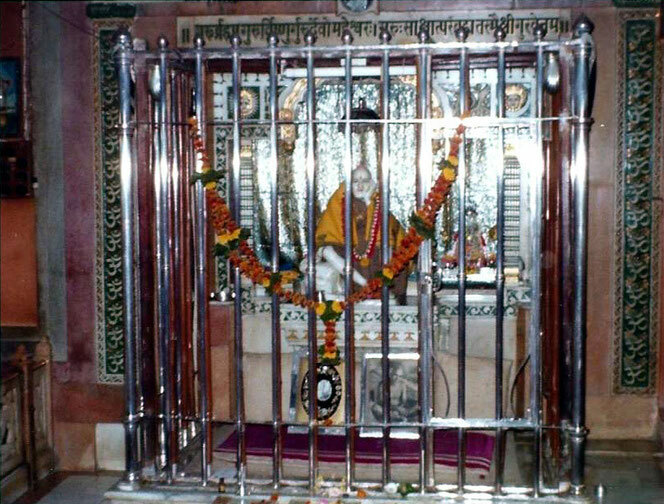 Sakori is located in Ahmednagar District of Maharashtra, about 5 kilometres (3 mi) from Shirdi. 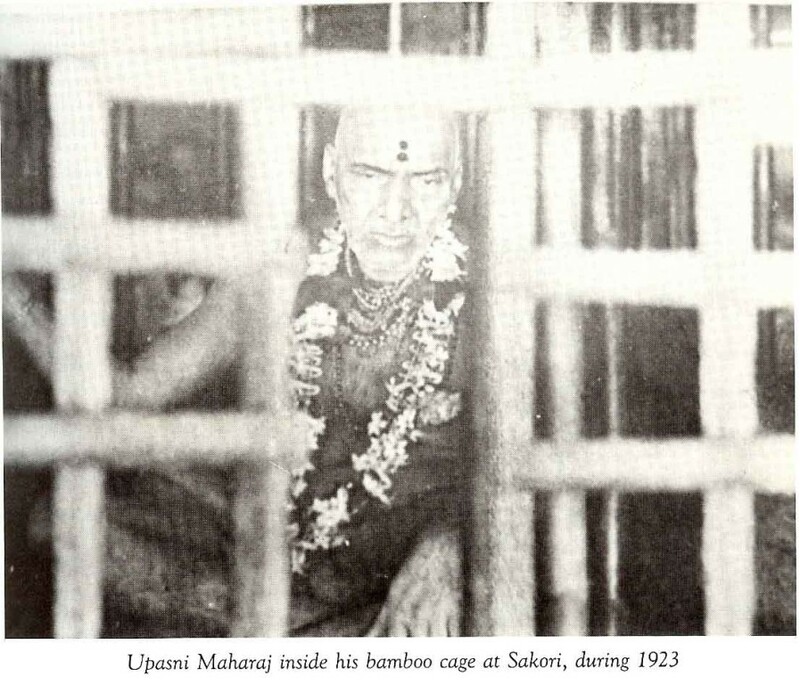 Upasni Maharaj was the second of five sons, born into a Hindu and Brahmin family of priests in the village of Satana, India, in the district of Nasik. 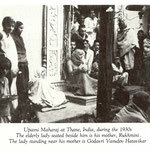 His father's name was Govind Shastri and his mother's, Rukhmini. 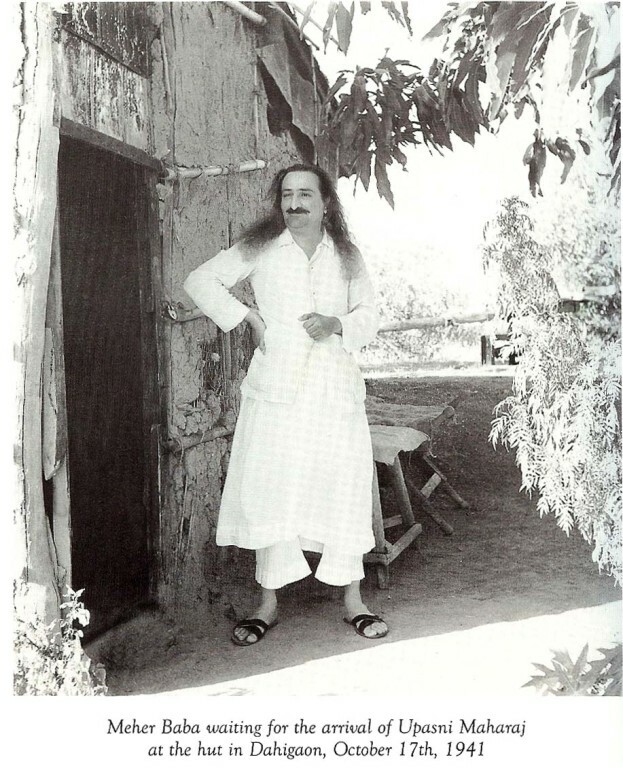 After a career as an ayurvedic doctor and three marriages where all three wives died, he began to hear a singing voice that he could not explain. 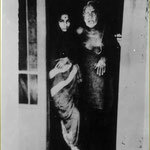 This troubling sound, along with various other problems, led him on a difficult quest that finally culminated in him meeting Sai Baba of Shirdi who is said to have given him God-realization at the age of 42. 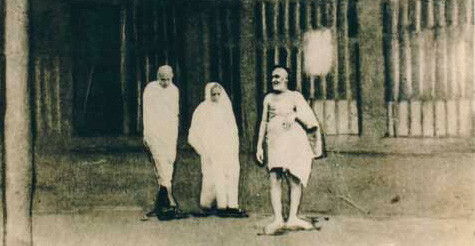 Sai Baba then claimed to be the one who was calling him inwardly. 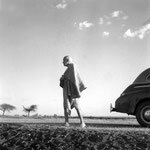 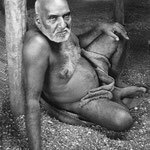 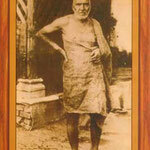 He died in Sakori, India on December 24, 1941, at the age of 71. 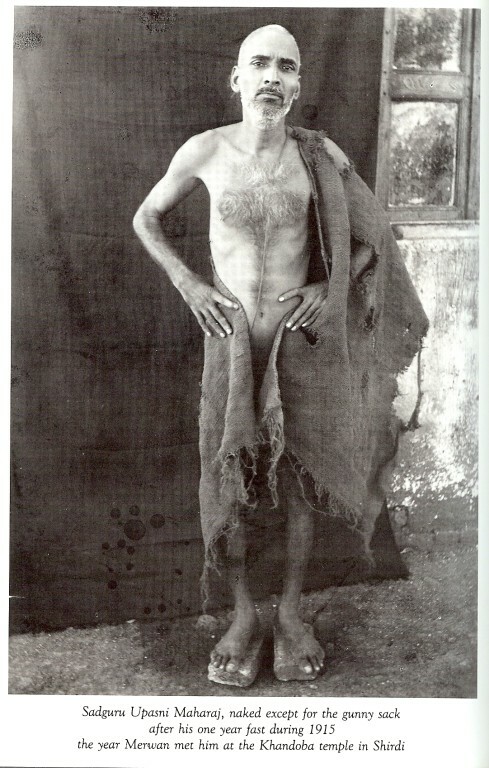 Not to trouble anybody in the least. 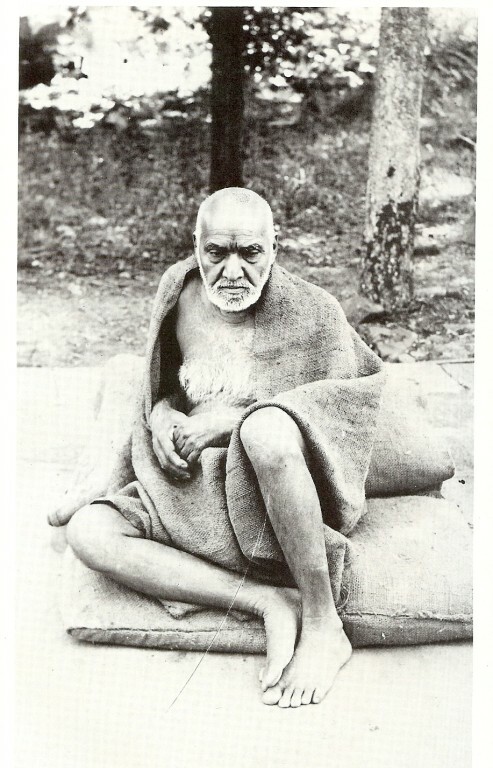 To suffer for and be useful to others. To remain contented in a state of Be as it may. 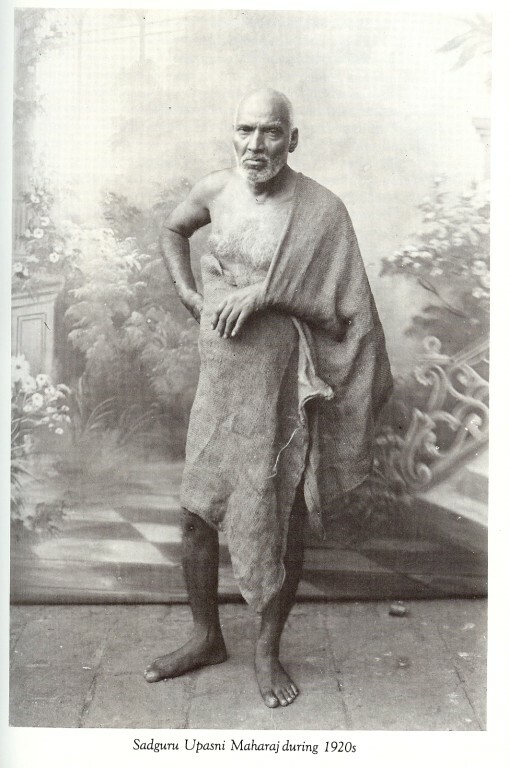 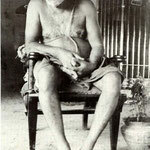 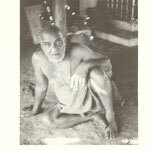 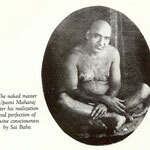 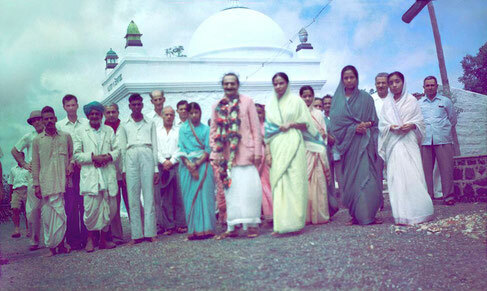 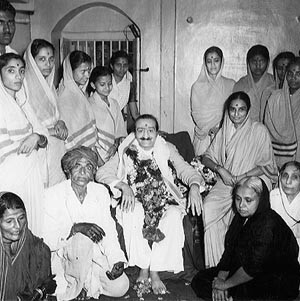 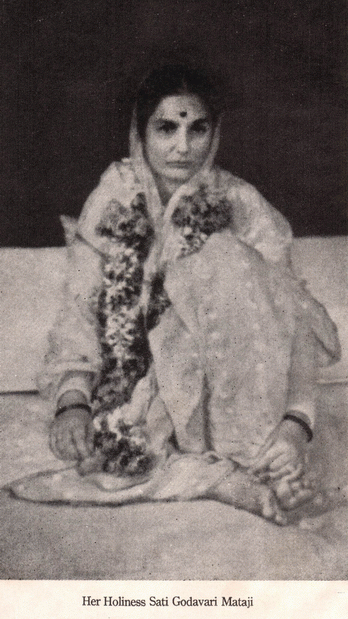 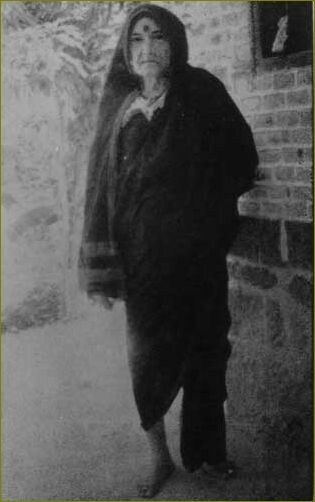 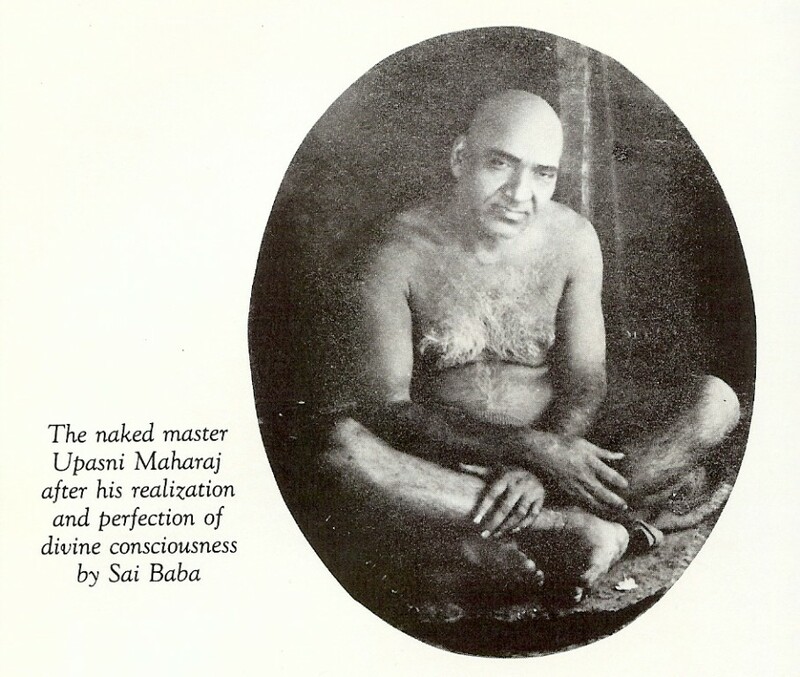 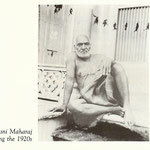 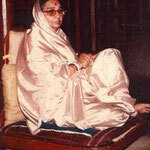 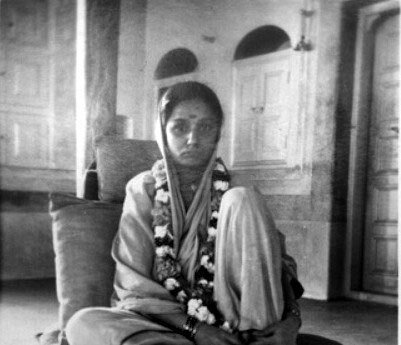 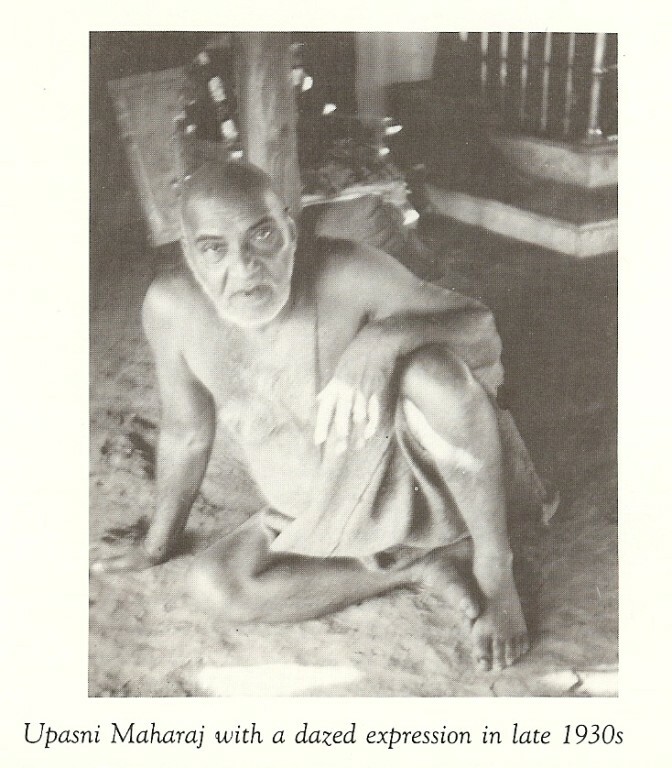 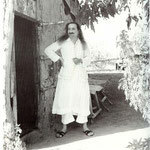 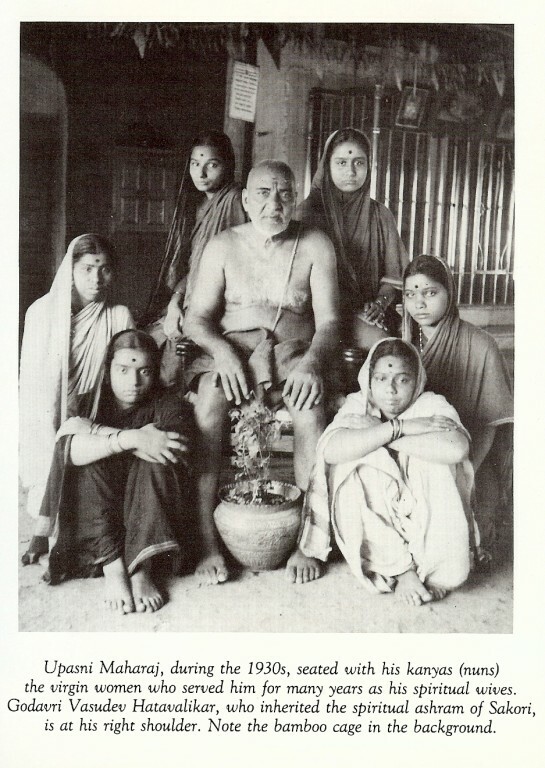 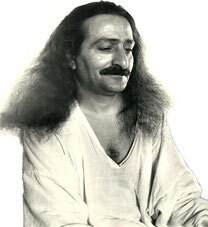 Upasni Maharaj was the principle teacher of Meher Baba. 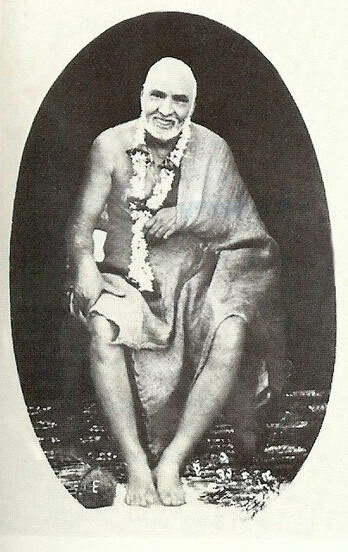 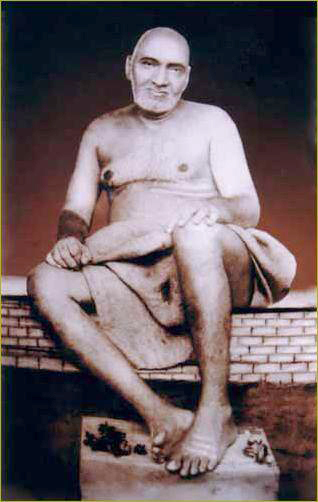 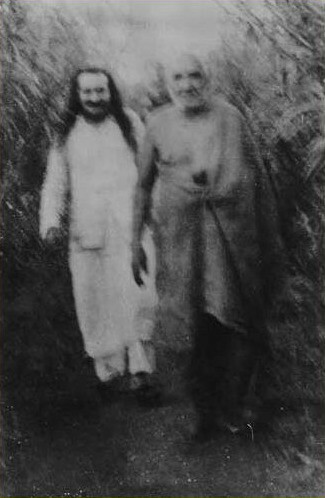 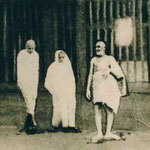 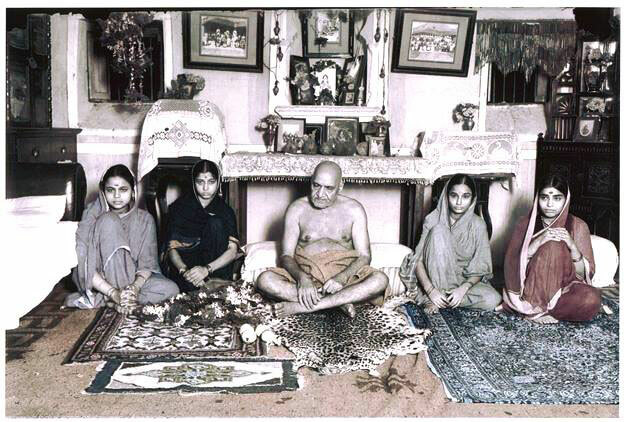 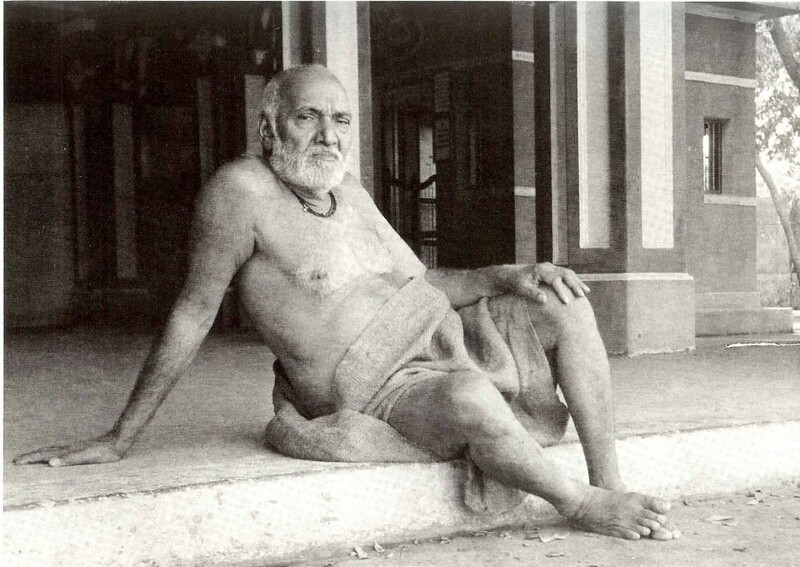 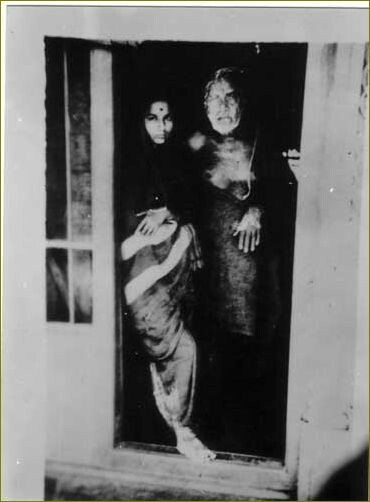 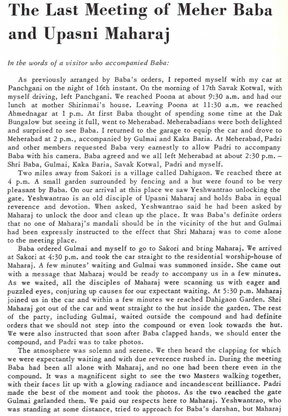 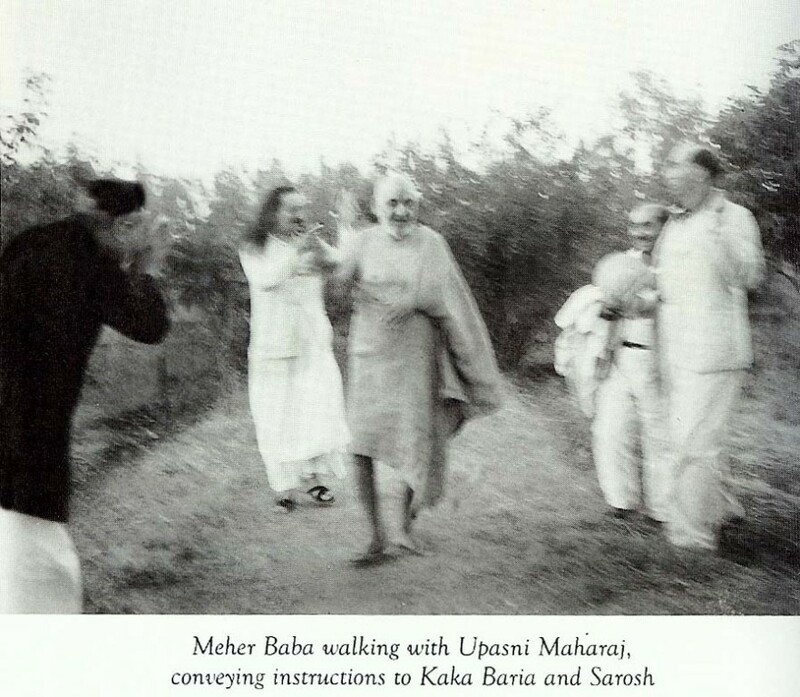 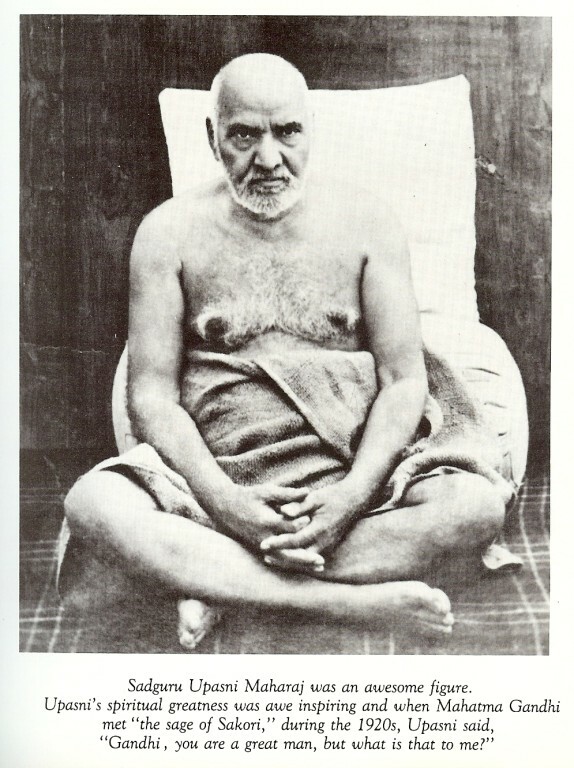 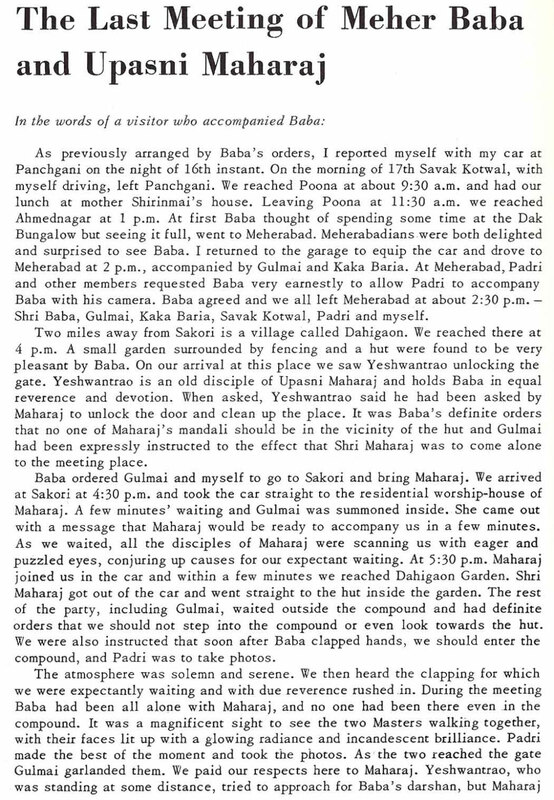 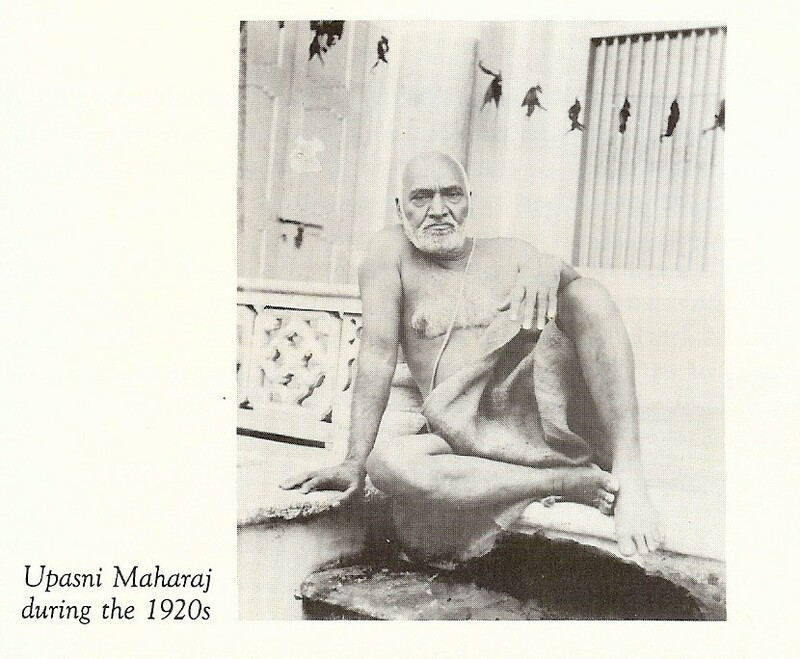 Meher Baba first met Upasni Maharaj in 1914 when Upasni was staying in Shirdi with Sai Baba. 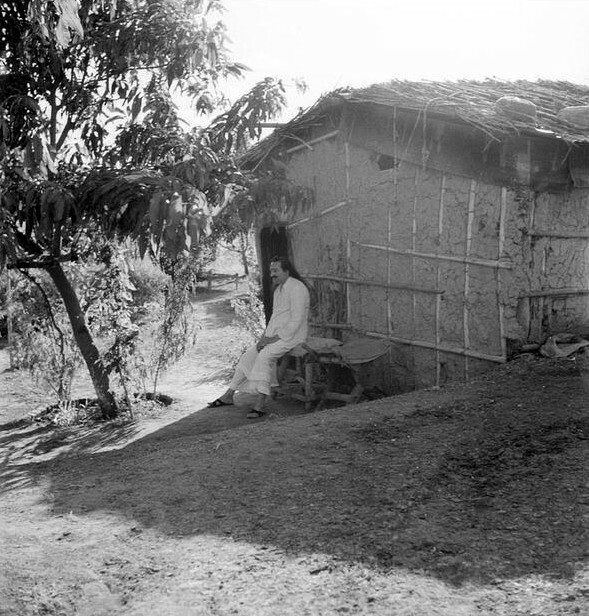 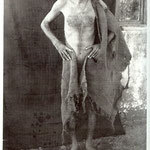 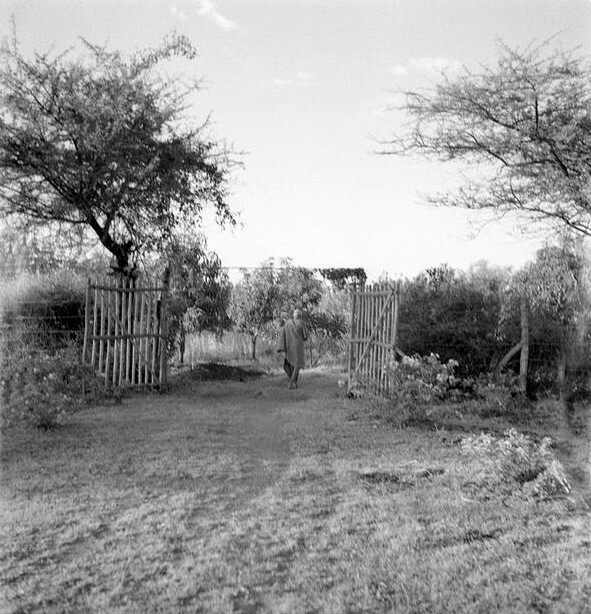 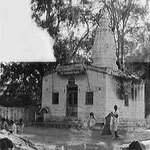 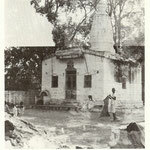 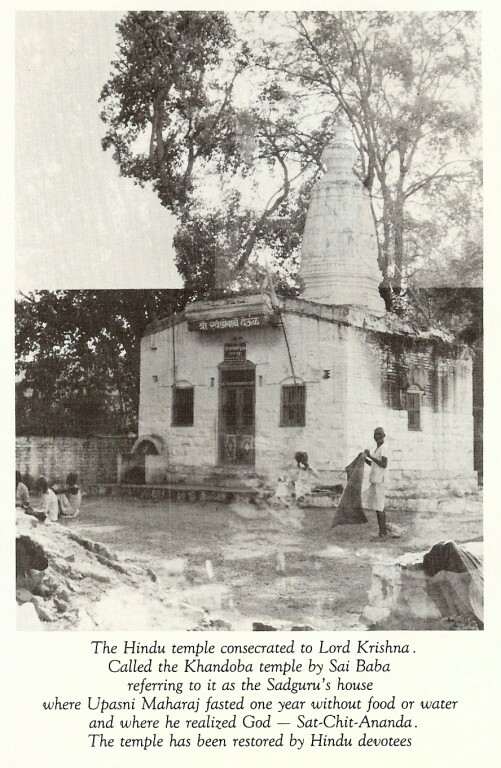 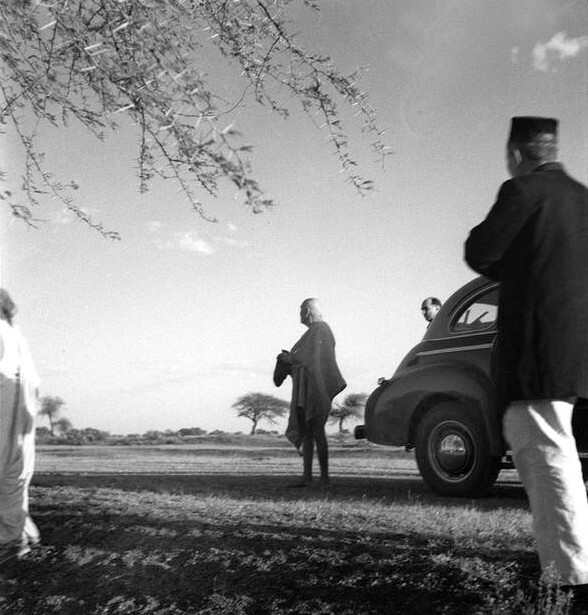 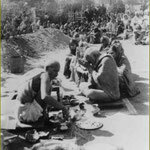 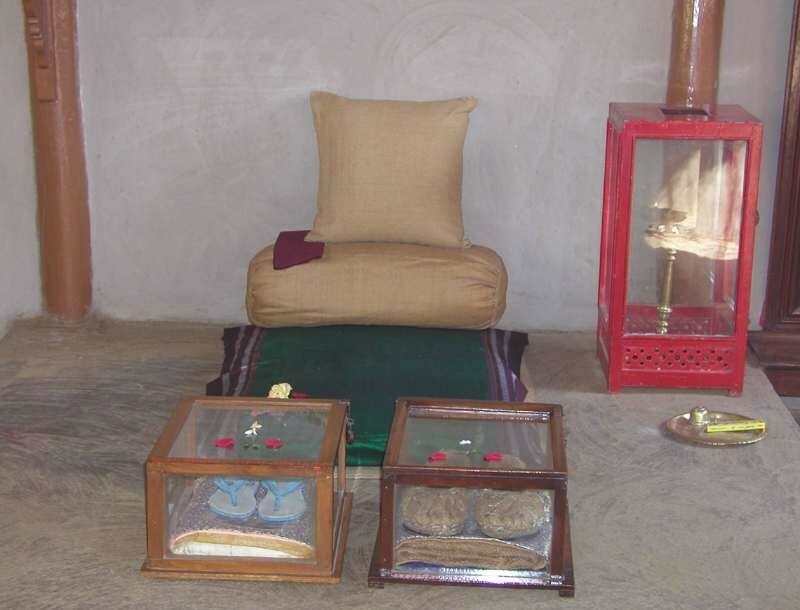 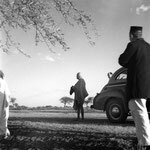 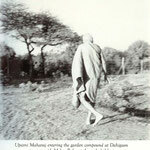 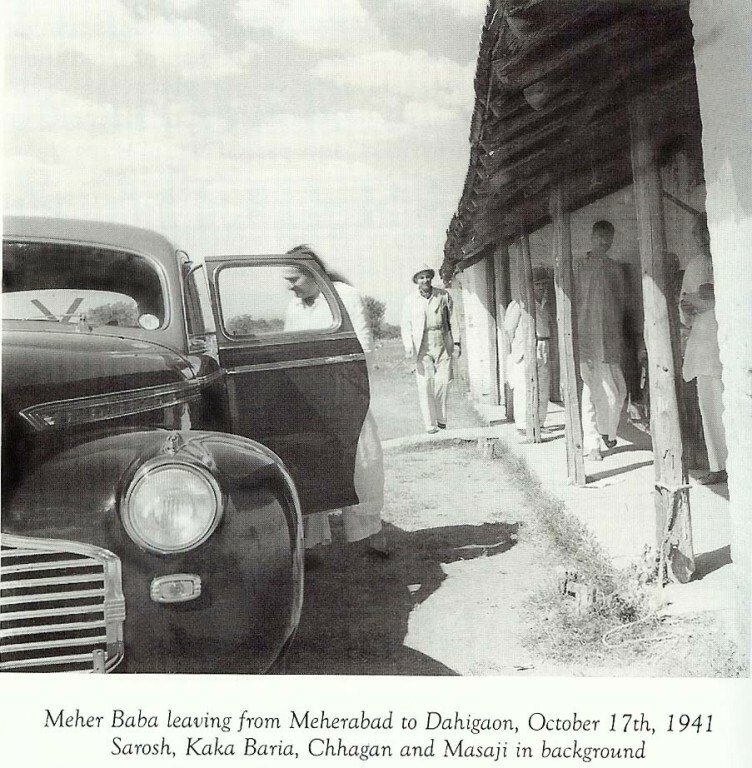 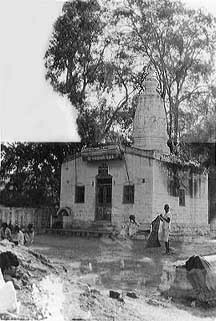 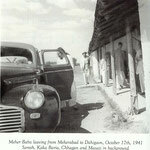 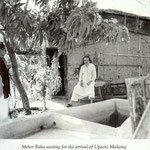 Upasni moved to Sakori in July 1917 and Meher Baba frequently stayed there as late as October 1922. 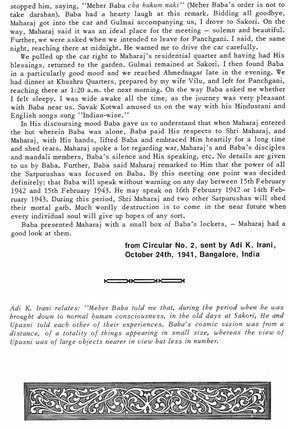 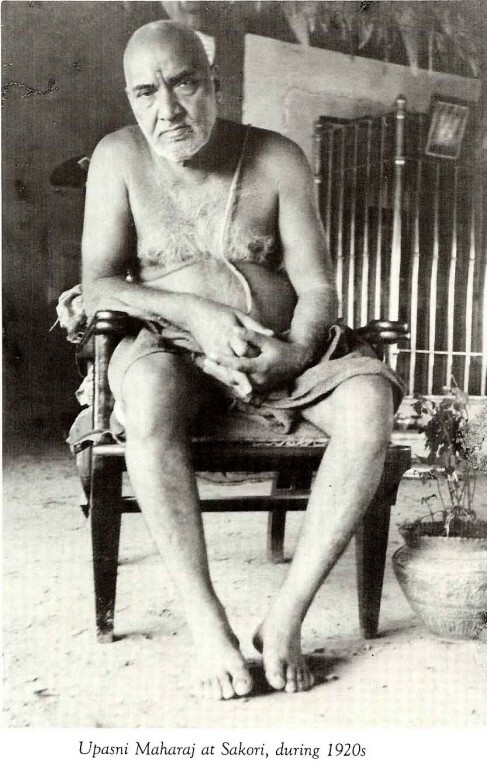 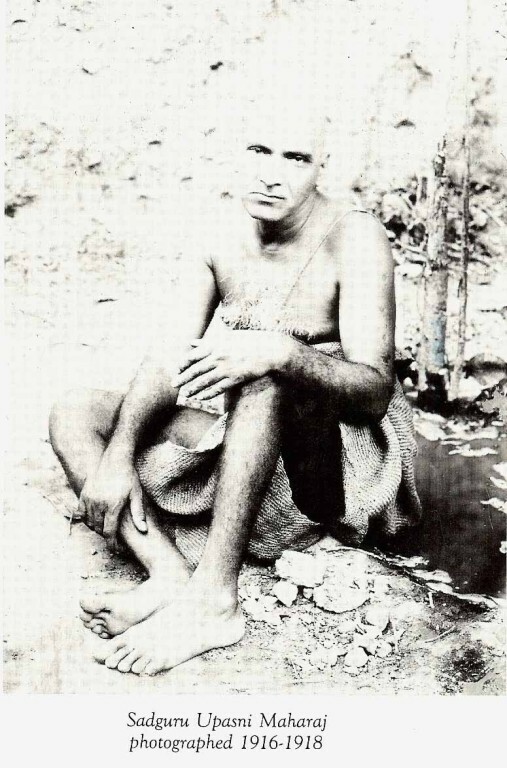 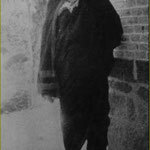 According to Meher Baba, Upasni Maharaj gave him divine knowledge after he received God-realization in January 1914 at the age of 19 from Hazrat Babajan. 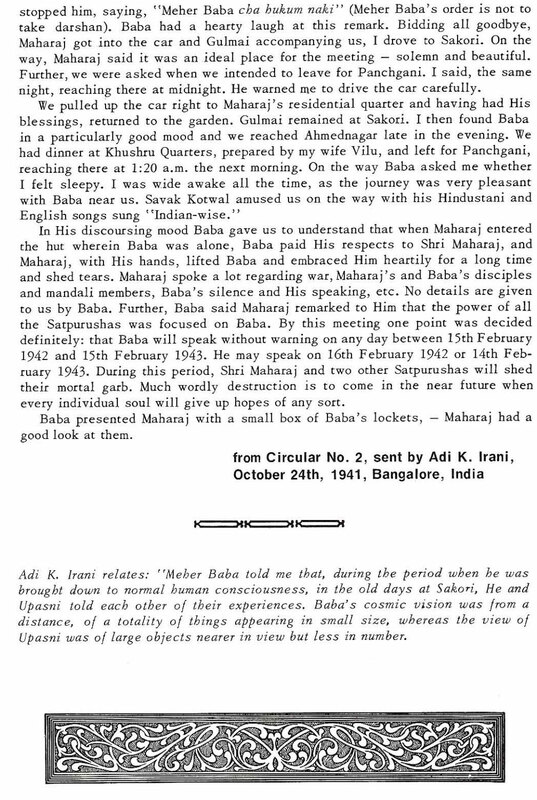 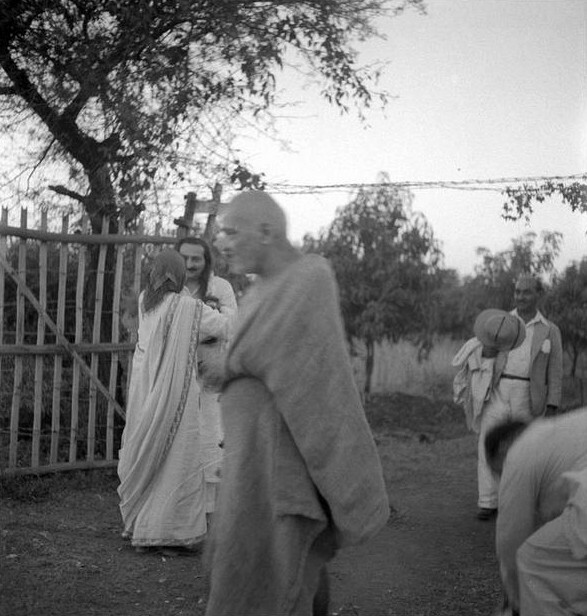 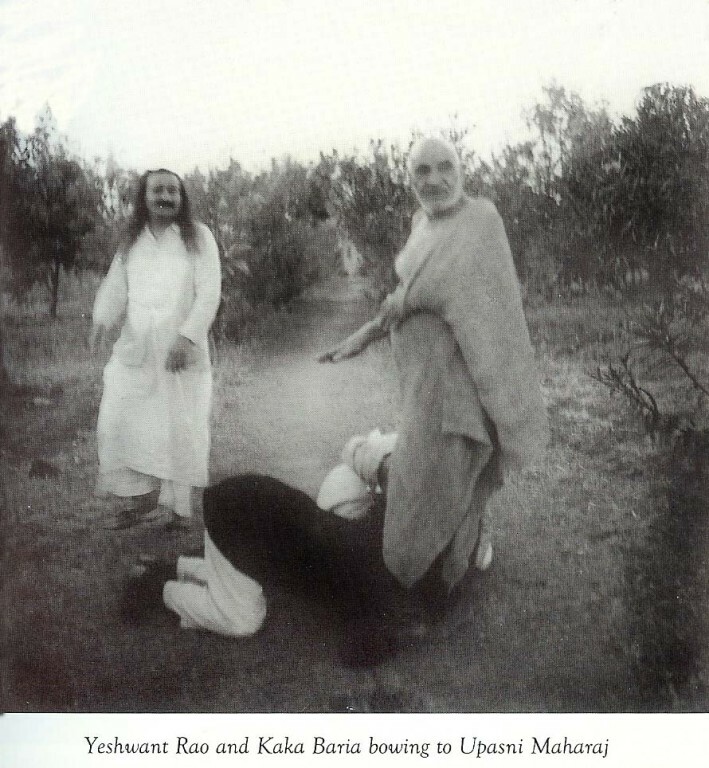 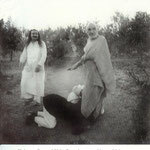 Purdom recounts that, at the end of December, 1921, Upasni made several comments relating to Meher Baba. 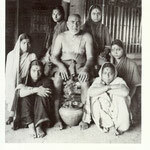 He said to his disciples: 'I have given my charge to Meherwanji. 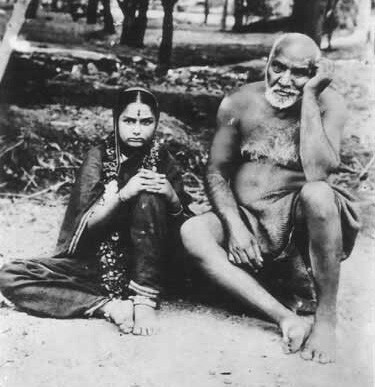 He is the holder of my key.' 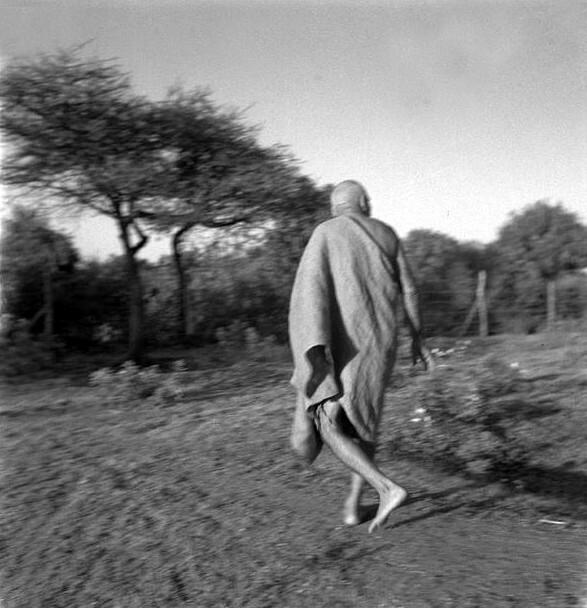 Some time later he said 'This boy will move the world. 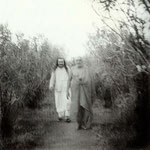 Humanity at large will be benefited at his hands.' 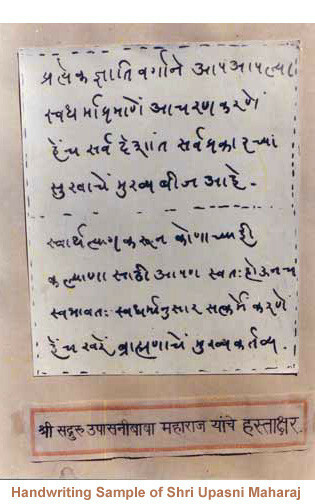 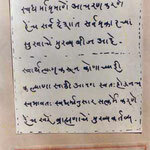 A few days later he sent for Gustadji Hansotia, one of his leading disciples, and told him 'I have made Meherwanji perfect. 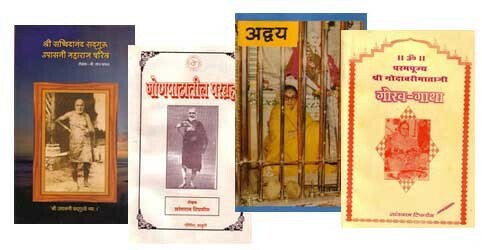 He is the Sadguru of this Age. 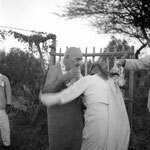 Now you have to leave me and stick to him.' 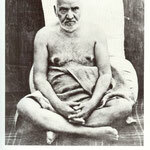 To Behramji he said 'Your friend is God-realized; carry out every command and every desire of his.' 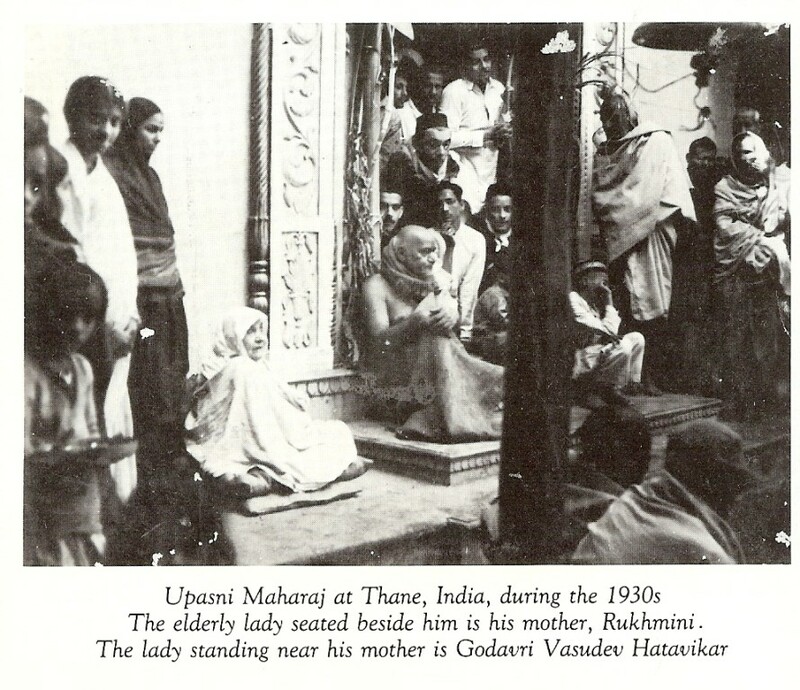 Finally, one night he folded his hands and said 'Meherwanji, you are adi-shakti: you are Avatar. 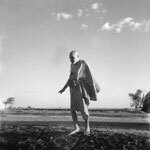 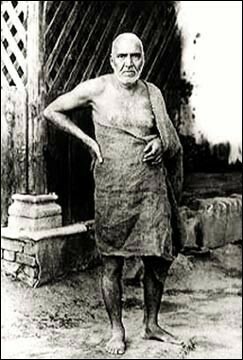 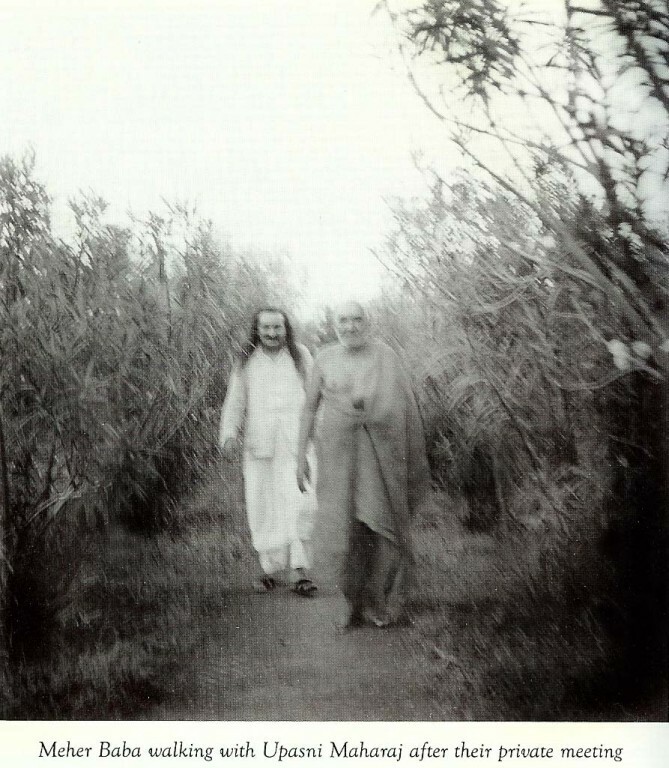 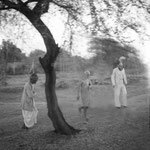 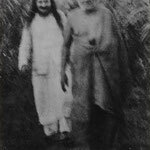 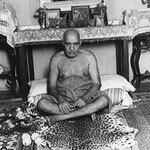 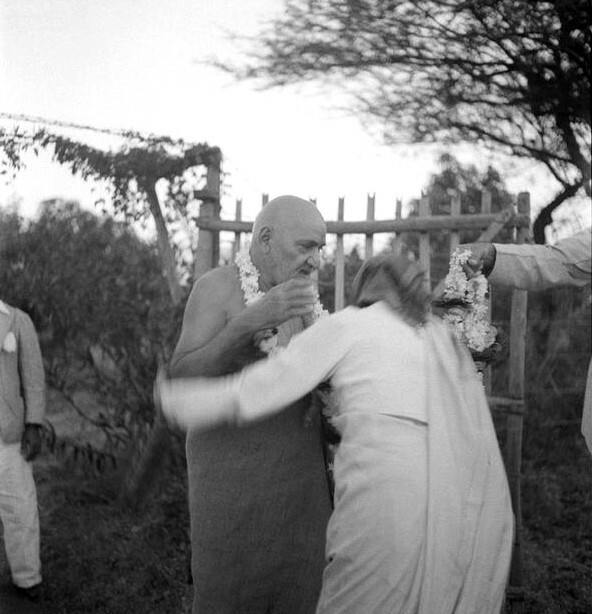 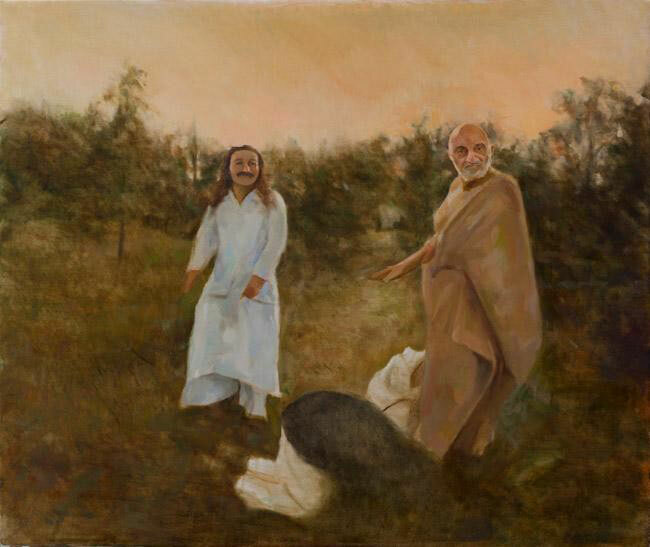 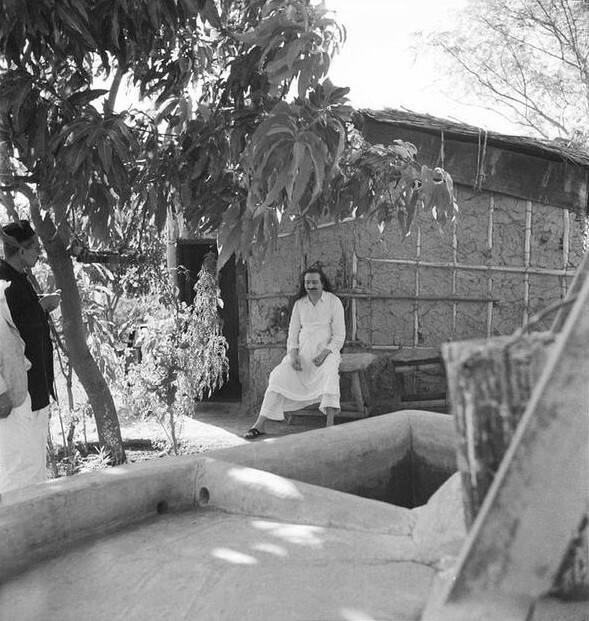 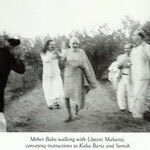 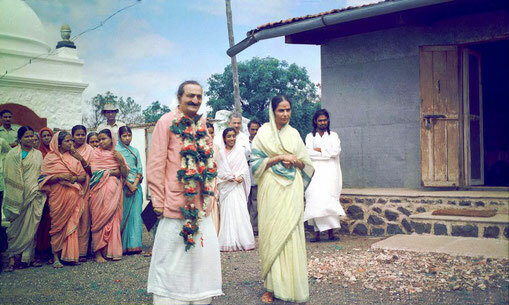 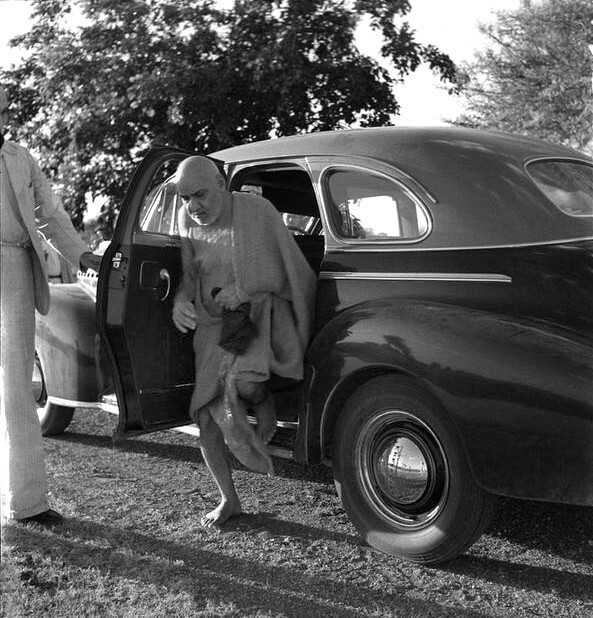 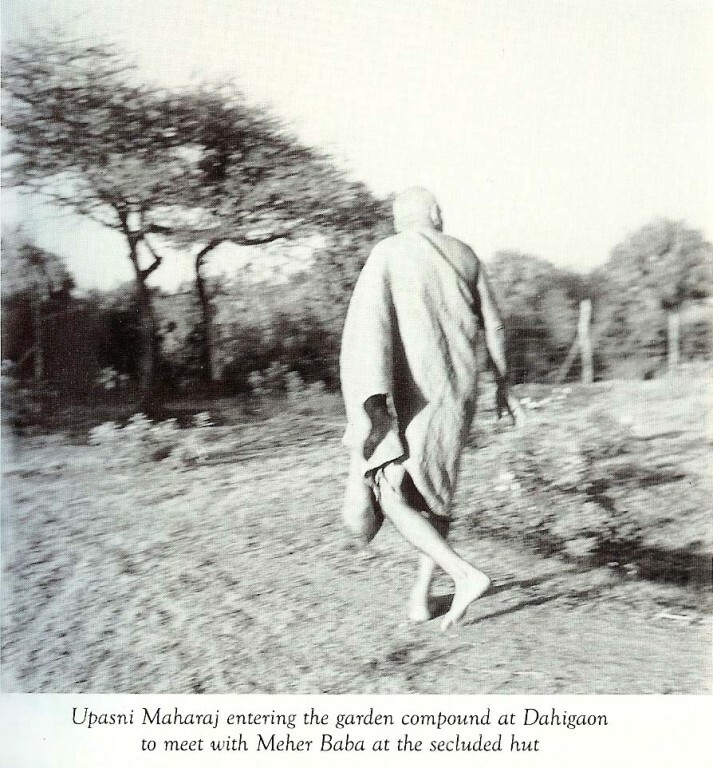 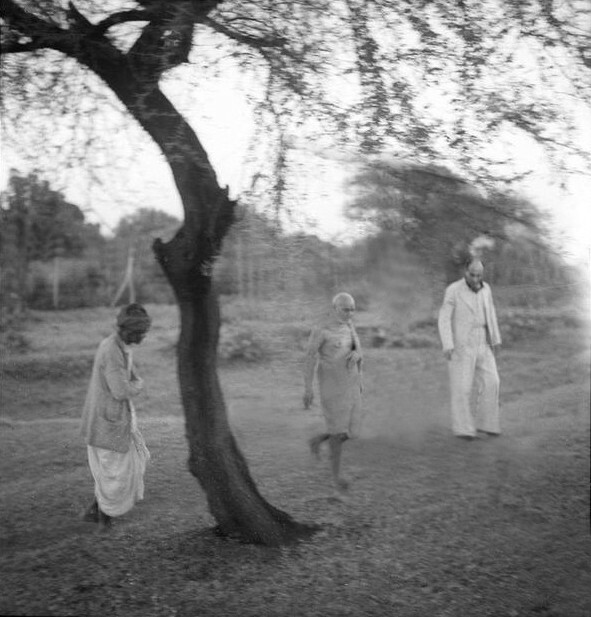 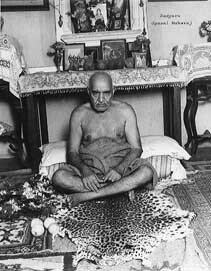 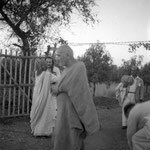 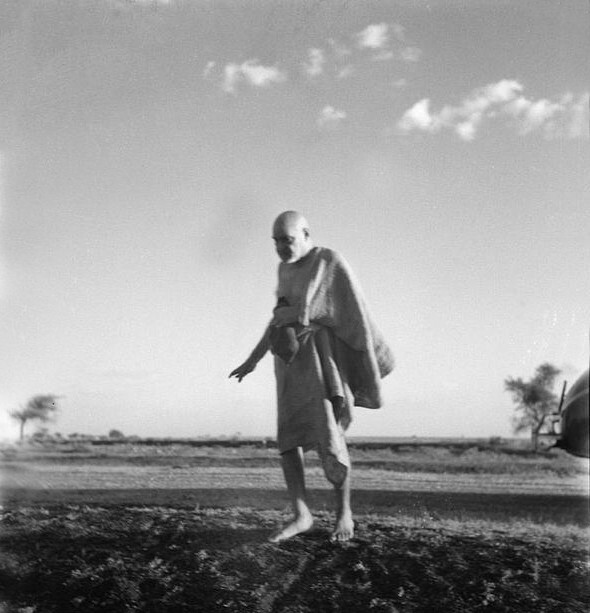 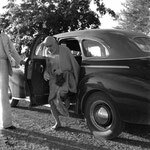 After a separation of nearly 20 years, Meher Baba and Upasni Maharaj met for the last time on October 17, 1941 in Dahigaon, a small village in Niphad Taluka in the Nashik District of Maharashtra, just two months before Upasni's death ( ** dropped his body ). 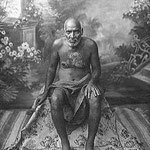 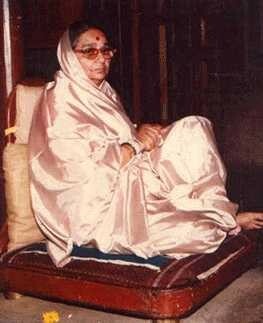 "Once association with God is well-established, then, as all the worldly things stand before one's eyes at the last moment, that association will also be there at that time. 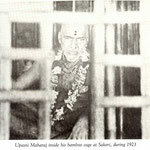 Meaning, whatever good or bad one may have done in the cause of Lord Krishna is bound to have its effect in the end. 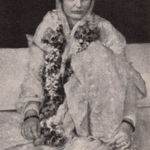 "What is commonly remembered most? 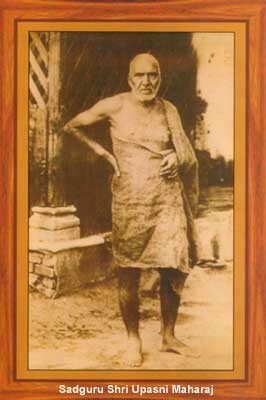 Things that have occurred against one's will and understanding are always remembered better. 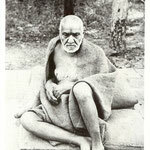 That is why being beaten by a Perfect one, or the abuses he had given, or his association with a prostitute, and things like that, which are opposed to the common ways of the world, force themselves before one's eyes at the last moment. 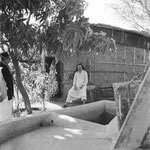 "If you firmly believe the Perfect one to be Lord Krishna, then Lord Krishna is bound to stand before you at the last moment. 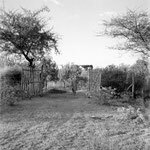 If you remember a piece of this sack-cloth, a tree from here, the garden, all my whimsical activities, the cage, the hut, the tipris, or anything from this place for that matter, that is bound to stand before you at the last moment. 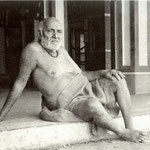 In short, anything good or bad experienced in association with a Perfect one is useful in the end. 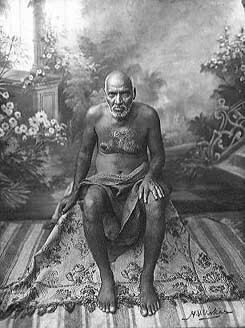 "Remember and remember well, that remembrance of anything pertaining to God or a Perfect one, even a mimicry of him, is never wasted..."